"Mt Sugarloaf", West Wallsend. Hard Medium: 4.8km, +165m, 13c. 12th/26 (29:36 behind Glenn Burgess). 23°C. TE 3.4. Pretty happy with all my route choices. A shame about the big time loss on #8. Same area where I lost time in last year's SL15. Best leg: #11 (4th/26). Best pos: 7th/26 (#1, #7). #1 - Bear off second road loop to gully. #2 - Contour to tree root, then down to boulder. Twisted L knee scrambling over fallen tree. OK for the first part of the course. Couldn't stretch out on the medium legs to #10 & #11. #3 - Overshot slightly (lost 9"). #4 - Hesitated at the correct gully but had to back track from the next gully (-2:10). #5 - Long leg via tracks towards #7 (knee OK), using rocks as handrail to boulder. Caught up to Malcolm Roberts who started 3' ahead of me. #6 - Compass. #7 - Contours. 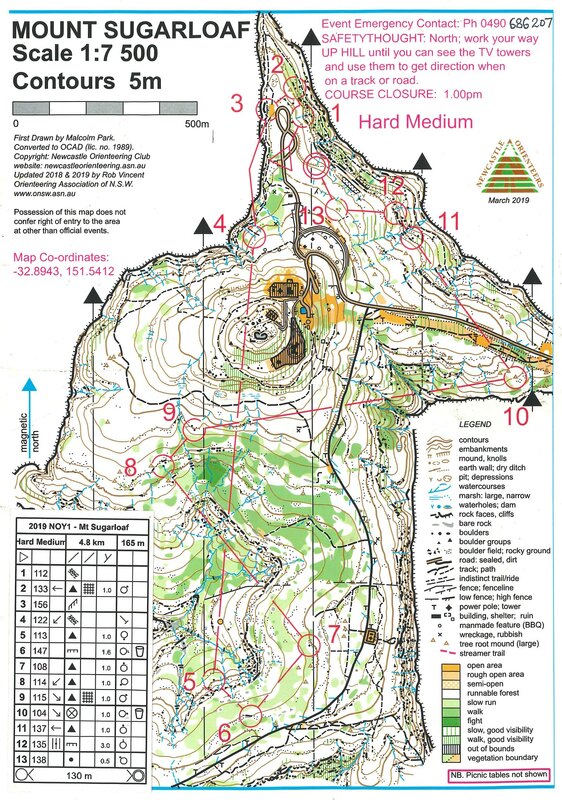 #8 - Plan: follow white N to E-W track; track W to rock line; rocks NW to bend; compass up hill to boulder. Got within 20m of control after 14:20 but looped around for another 11:10 / 660m. #9 - Tired (-2'). #10 - Medium leg via tracks to AP. #11 - Followed lower track from small car park. #12 - Contour to cliff. #13 - Compass uphill a bit left (-30"). #F - Straight. * Knee injury update: I'll try to get a physio appointment on Monday arvo. SL1/2 next weekend looks doubtful. Need to decide by Tuesday to save accommodation costs. ANSW Allcomers, Sydney Olympic Park Athletics Centre. 12-7pm. Very busy with only 3 officials in the start team today. Started all the hurdles, 200s, 3000s, the 5000m and the 10000m races. Just one DQ for a break in the men's 200s. 29°C. Bethany sliced 0.4s off her 400m PB this afternoon. Now stands at 54.85s. Lake Parramatta Park. Thought this might be a nice change. The lake is a bit further from work than is ideal. Also hard to get a good rhythm (cadence) and keep concentrating along the narrow twisty rocky trails. Distance was about right. Kept heart rate up. Probably a good pace for orienteering. Not sure if I will do this run again. 25°C. TE 3.0. Parramatta-Auburn loop (ACW). 26°C. TE 2.6. Parramatta-Dundas Valley loop (ACW). Roads wet and slippery in the shady areas after the morning rain. Saw my life flash before my eyes on the Evans Rd descent (52.2km/h @ 9.15km). A car at Sophie St on my right moved half way across the road before I had passed. It did stop but I couldn't be sure of that at the time. 22°C. TE 2.9. Parramatta Park. A detour around the new Western Sydney Stadium. Still a construction site but spectator signage is going up. 18°C. TE 2.4.